Update that old outdated Bathroom. Revive that tired old Kitchen. Add life to that waning old Room. Replace those hard to open Windows. 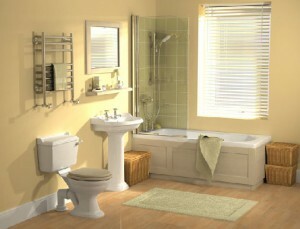 Remodel that Bathroom, Kitchen, Room or Deck. From Landscape Creations to Roofing and Everything In-between. 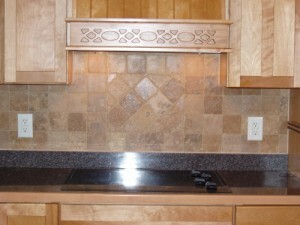 We can take care of all your Remodeling needs. We stand above other Remodelers. Plumber for the Charlotte region. Let Good Tydings Construction create the deck of your dreams. Or keep the patio under your deck dry on those rainy days. Decks come in all shapes and sizes. From small and basic to large and multi leveled with curves and angles. Decks can be constructed from a number of materials. Treated pine, redwood, cedar, composite, PVC and aluminum the choices are many. The most popular and least expensive would be pressure treated lumber. 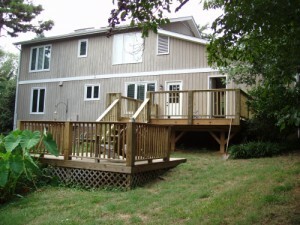 Although it is the least expensive does not mean that it is not a quality Deck Building Material. Properly cared for a deck constructed of this affordable building material can last for many years. It can be purchased at any Home Improvement Center making it readily available. The majority of decks built in the US today are constructed of this material. In fact treated lumber is used in the structure of decks built with other decking materials. The second most popular decking material used today is composite decking. The material cost for composite decking can be three to four times more than pressure treated lumber. here is a higher installation cost due to installation techniques. 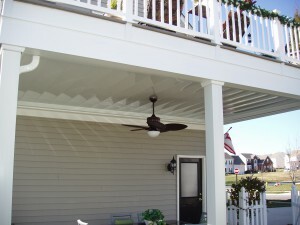 The up side is that composite decks don’t require the maintenance that treated decks require. They do require cleaning, mold and mildew will grow on it. Composite decks don’t split and warp as lumber will. The durability and appearance are worth the increased cost. PVC decking is a high quality decking material that requires even less maintenance than composite decking. Mold and mildew does not grow on it as readily as on composite decks. There is no wood in PVC decking as there is in composite. It withstands the elements better than composite or treated lumber. The color is more stable than other materials. PVC railing is vastly superior to composite or lumber. 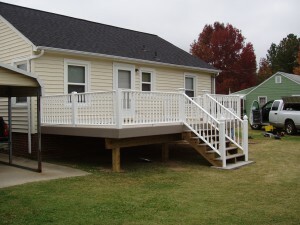 Whether you choose lumber, composite or PVC for your deck, PVC or vinyl handrails should be used. Treated and composite railing will twist and bow while PVC and Vinyl will remain straight. Another high quality decking material is Aluminum Decking. Aluminum Decking is the most stabile of the decking materials. It has a simulated wood grain and comes in a multitude of colors. It does not expand and contract as much as PVC, composite or lumber. There is matching aluminum railing. It is the longest lasting and most durable decking material. It stays cooler in the heat of the day depending on color. Aluminum deck boards fit together and keep the area below the deck dry. This makes it ideal for a deck over a patio. Unfortunately aluminum decking is the most expensive. But it will last forever with virtually no maintenance. 704-699-7714. Also serving northern South Carolina. 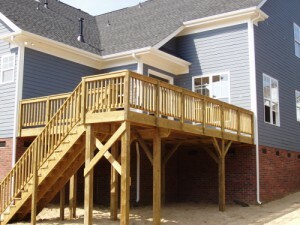 Tydings Home Remodeling is the Deck Builder that can build the deck of your dreams.